Alt+` allows switching between windows of the same application in mutter. This doesn't work in gala. In the screenshot, the ugly popup to switch windows shows up, but doesn't switch beteen windows. To properly get the picture, open at least three windows of an application, and try to switch between them while keeping Alt pressed, which doesn't work. Gotta sort it out (fix or disable) for Luna. 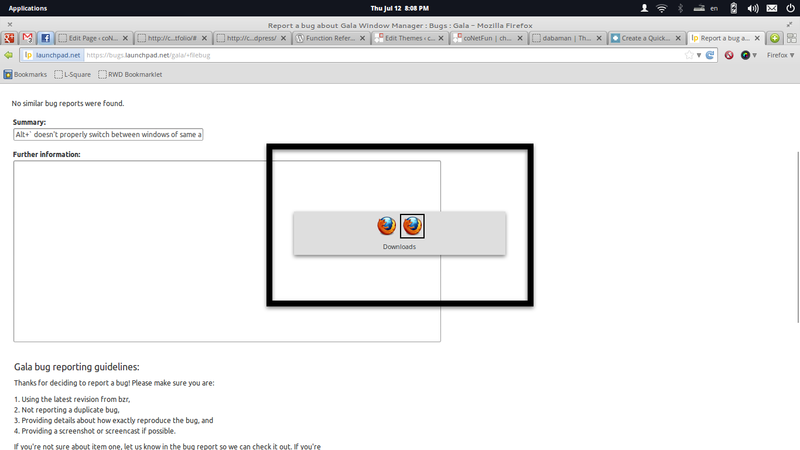 It does switch windows in Firefox. What Gala version you're using? If you try to switch by keeping Alt pressed, it doesn't work. I'm updating the description accordingly. btw I tried using both the ppa and trunk.